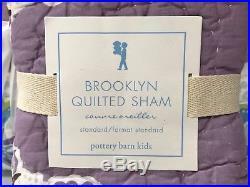 “BROOKLYN QUILT AND SHAM”. Made of 100% cotton voile with 270 gram weight cotton batting. Expertly quilted by hand. Block printinspired whole cloth quilt. Quilt and sham reverse to a floral block print on aqua ground. 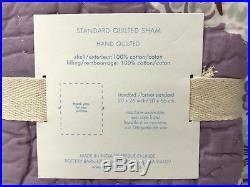 Shams feature a tie closure and a quilted front. 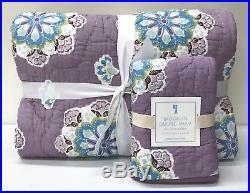 The item “NEW Pottery Barn KIDS Brooklyn FULL/QUEEN Quilt + 1 STANDARD Sham, LAVENDER” is in sale since Monday, May 7, 2018. This item is in the category “Home & Garden\Kids & Teens at Home\Bedding\Bedding Sets”. The seller is “e*fairtrade” and is located in Lawrenceville, Georgia. This item can be shipped to United States, Canada, United Kingdom, Denmark, Romania, Slovakia, Bulgaria, Czech republic, Finland, Hungary, Latvia, Lithuania, Malta, Estonia, Australia, Greece, Portugal, Cyprus, Slovenia, Japan, China, Sweden, South Korea, Indonesia, Taiwan, Thailand, Belgium, France, Hong Kong, Ireland, Netherlands, Poland, Spain, Italy, Germany, Austria, Israel, Mexico, New Zealand, Philippines, Singapore, Switzerland, Norway, Saudi arabia, Ukraine, United arab emirates, Qatar, Kuwait, Bahrain, Croatia, Malaysia, Brazil, Chile, Colombia, Costa rica, Dominican republic, Panama, Trinidad and tobago, Guatemala, El salvador, Honduras, Jamaica.